Show Racism the Red Card (SRtRC) visited Ayr United’s Somerset Park on Thursday 10th April to host a full day educational event with some of Ayrshire’s top aspiring young footballers. Forty boys from the under 11s/12s Ayr United Football Academy attended the day as part of their ongoing Easter training schedule. The day was designed to promote messages of equality and respect, allowing the young people to explore their views and knowledge about racism in a safe environment whilst learning about some of the history and the consequences of racism in our society. Current and ex-professional players were on hand to share their own experiences and highlight the importance of challenging racism safely wherever it may occur. The boys took part in interactive workshops which were led by the SRtRC education team, and were able to draw upon their knowledge of recent examples of racist behaviours within football that have been reported in the press. Red Card ex-professionals Derek Ferguson and Robbie Winters assisted in each workshop and highlighted the importance of respect, equality, discipline and good attitude whilst training and playing to reach a professional level. After viewing the SRtRC educational DVD the group was joined by Red Card supporter Campbell Peden, of UNISON South Ayrshire, and also Ayr United first team players Michael Moffat and Michael Donald. These guests then formed a panel of speakers alongside the Red Card coaches to take questions from the boys about racism in society and football. The boys were especially excited to have the chance to meet and speak to the first team players and were even treated to an extra 5 minutes of football related questions with the two Michaels before autographs, goody bags and prizes were given out, and the day came to an end. This was the first time that the Red Card team have led an educational event like this aimed specifically at pro-youth teams. It was a fantastic day and something that we would like to see more clubs being part of in the future. 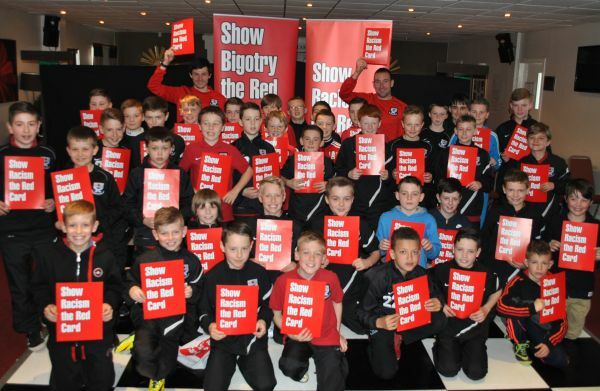 Dee Matthew, Show Racism the Red Card Education Coordinator said, “The continued support received from Ayr United Football Academy & Club demonstrates their clear commitment to stamping out racism and sectarianism in football and society. This kind of work equips young people to deal with racist and sectarian attitudes and behaviours. Recent events have shown we can’t get complacent about the issue and the club are to be commended for ensuring the message gets through to young players”. The event was funded by the Scottish Government.